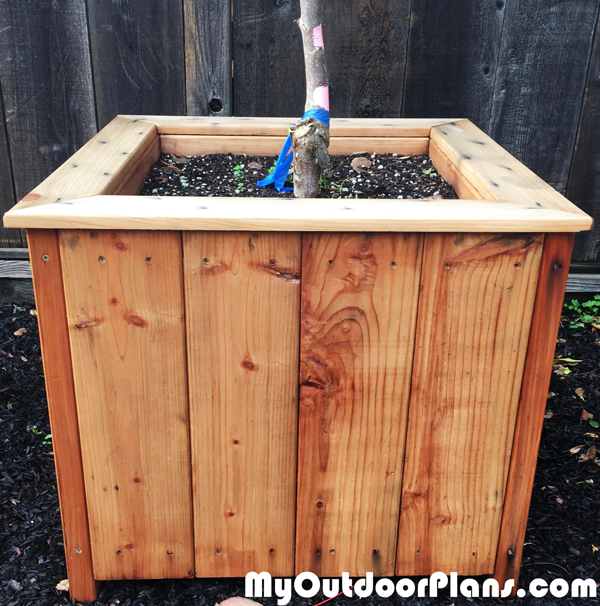 Made the planter with sanded redwood. Entire project cost about $200 for the wood not counting screws. Lumber was purchased in NorCal at lumber yard. It is very solid and pretty heavy once built. I used finish nails to attach the top trim but I might replace with screws. To move the planter the inclination is to grab the trim but finish nails will not support the weight of the planter. I appreciated how little wasted wood there was at the end of the build. I find the vertical lines of the box appealing. They match the vertical look of a tree. Congrats for the project, Tom! It looks great and I agree, this basic design with vertical lines is very modern and beautiful!